Sweet swirls of cinnamon, brown sugar and nutmeg all rolled up inside puffy Eggnog Cinnamon Rolls. The Eggnog Cream Cheese Icing caps off and sinks right into the middles of each of these warm swirling sensations! Are you ready for a sweet holiday treat this eggnog season? The creamy drinkable stuff just isn’t for drinking. In my little world, it means eggnog is for baking! These special cinnamon rolls just got a little hyped up over here– eggnog style. Special in the sense that there’s sweet, creamy eggnog twirling around in every crevice of these tender, moist cinnamon rolls! I’m basically obsessed in love with making (and eating) cinnamon rolls on any given day. But these Eggnog Cinnamon Rolls are sinfully delicious! Not only is there eggnog in the actual dough, but there is also eggnog in the creamy frosting. The creamy eggnog really gives these cinnamon rolls a moist texture and exquisite taste without being overbearingly eggnoggy. At least that’s what the teenager said– which, might I add, is one of my official taste testers. Just for the record, he devours (more than a few of) these before they can even cool down. I’m going to take you through the simple steps in making these amazing cinnamon rolls from scratch. Have all of your ingredients out and ready. Huge note: your eggnog and eggs need to be at room temperature. But if you are impatient like me, set your cold eggs in a bowl of hot water. The cold eggs will cool the water down and the hot water will warm the eggs right up. Works like a charm. The other thing, the cold eggnog. Pour 1/2 cup cold eggnog in a liquid measuring cup. Set the measuring cup into a bowl of hot water. This is my method of rushing things along. You can make and have these (big!) babies baked all within an hour! First things first, there’s absolutely no need to be intimidated by the Y word = yeast. It’ll be your best friend. I promise. Place the (active dry) yeast, sugar, and water together. Give it a little stir. Set off to the side for 10 minutes. I like to set mine inside of the microwave (no power), because it is a draft free zone. Just let the yeast do it’s magic. Once your yeast is proofed, as shown in the image above, stir in the honey. It will deflate a little. No worries. If you have a stand mixer, attach the dough hook or use a large wooden spoon to mix by hand. Put only 3 cups out of the 3 3/4 to 4 cups of bread flour in a large mixing bowl. Then add the proofed yeast-honey mixture with the room temperature eggs and room temperature eggnog. Along with rum extract. I almost always use the real rum stuff– my much bigger bottle of baking Spiced Rum. You know, just like the eggnog, love it in baked goods! But, Miss Beatrice behind the tiny pharmacy counter with the ever more tiny alcoholic beverage area (our town’s liquor store) in the near corner, has that look of very high doubt when I tell her it’s for baking… at 9:00 in the morning. Because I should had some how known Utahns can’t start drinking until 10 a.m.! Silly me. Mix the mixture on low and slowly add the last 3/4 cup to 1 cup of bread flour. You want to make sure it’s not sticking to the sides of the bowl. This takes about 4-5 minutes to achieve– in a stand mixer. Don’t over mix. Take the ball of dough out of the bowl and place on a floured surface. Place the empty bowl on top to cover the dough for 10 minutes. By doing this, it relaxes the gluten in the flour It also helps the dough to cooperate when rolling out. AND when baked, the texture is super tender… almost literally melts in your mouth. Roll out the dough (on the lightly floured surface) to a rounded rectangle size in the neighborhood of 15 inches by 12 inches. And, about 1/2 thick. Be sure to not over work the dough. What makes this so fun, is that it doesn’t need to be perfect. Spread butter flavored shortening on the laid out dough. (I’ve tried real butter and to my surprise it doesn’t come out with the same great results.) Pile on the brown sugar, sprinkle the cinnamon and nutmeg to all the edges. Except the one edge you are going to have the roll sealed. Grab a long piece of thread and slice it up underneath the roll. 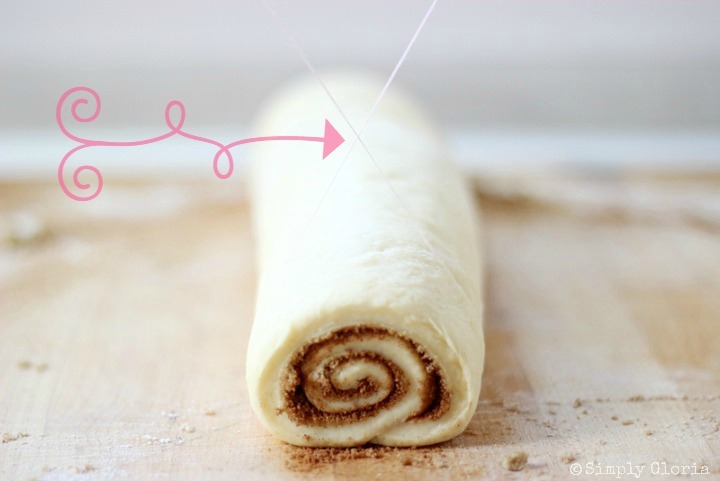 Crisscross the thread while going down onto the dough. It will cut with out smashing the dough. 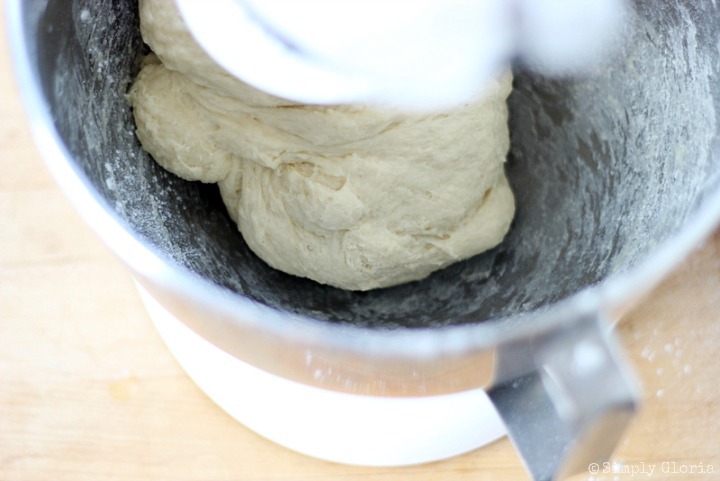 Tip: Only use a knife to mark the top of the dough (to get even cut pieces) before using the thread. Makes about 12 cut rolls. Gently lay the rolled pieces of dough onto a large greased baking sheet. Place each one about 1/2 inch apart to allow room to rise. That includes from the edges from the pan. Set these beauties, uncovered into a draft-free zone… aka, the turned off microwave, for 10 minutes. Tip: Before placing the dough in the (off) microwave, boil water in a microwave safe bowl and leave in there until it’s time to place in the dough. It will make the draft-free zone like a warm cozy sauna for the rolls. 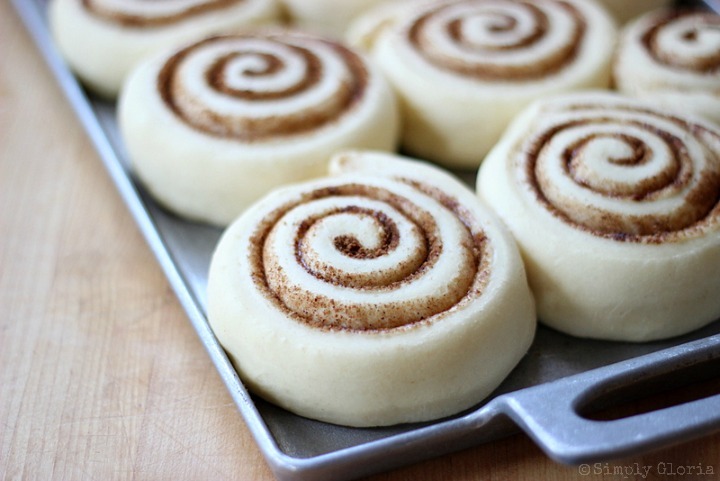 Now that the cinnamon rolls have had some time to rest in the draft-free zone, they are looking ready to bake! They will puff up even more the moment they enter the preheated oven. While the aroma of fresh baked sweet rolls are baking in the oven for 20 minutes, whip up the Eggnog Cream Cheese Icing! The moment the rolls come out of the hot oven, smother them with the icing so it gets into every crevice! Sweet swirls of cinnamon, brown sugar and nutmeg all rolled up inside puffy, drunken Eggnog Cinnamon Rolls. The Eggnog Cream Cheese Icing caps off and sinks right into the middles of each of these warm swirling sensations! These may be made the night before and baked in the morning! 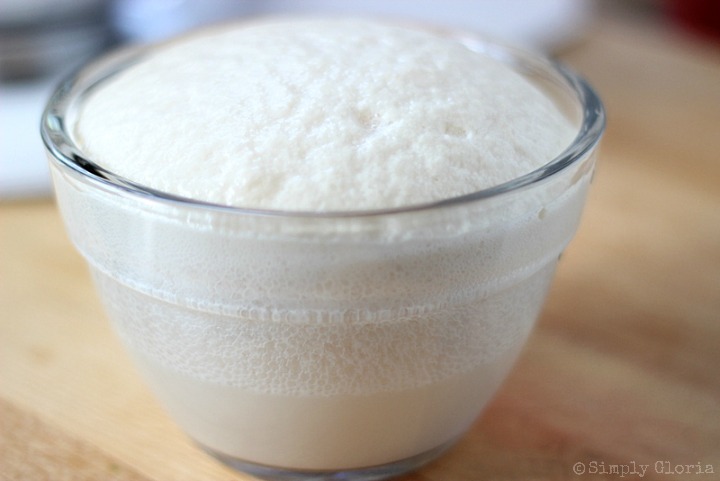 Combine yeast, granulated sugar, and warm water in a small mixing bowl. Set aside in a draft-free zone for 10 minutes. Once the yeast mixture has proofed, stir in the honey. Add the proofed yeast-honey mixture, eggnog, beaten eggs, and rum extract into a large mixing bowl with 3 cups of bread flour. 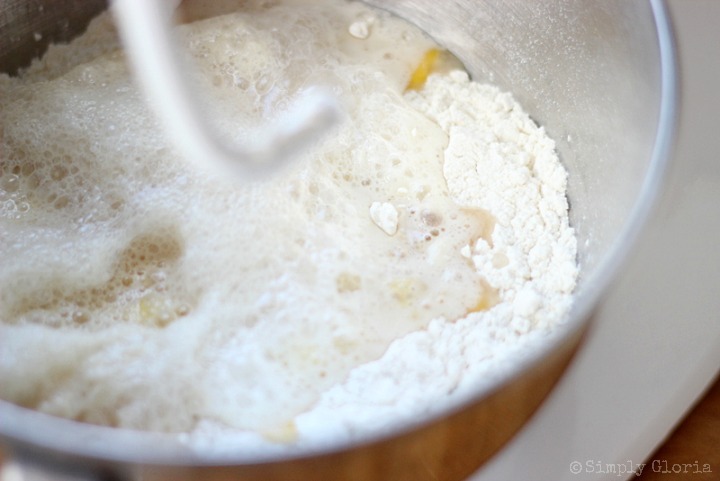 Mix by hand or use a dough hook with a standing mixer on low speed. Slowly sprinkle in the rest of the flour while it is mixing. Keep mixing until the dough has pulled away from the sides of the bowl. Add additional flour one tablespoon at a time, if needed. Do not over mix or knead. 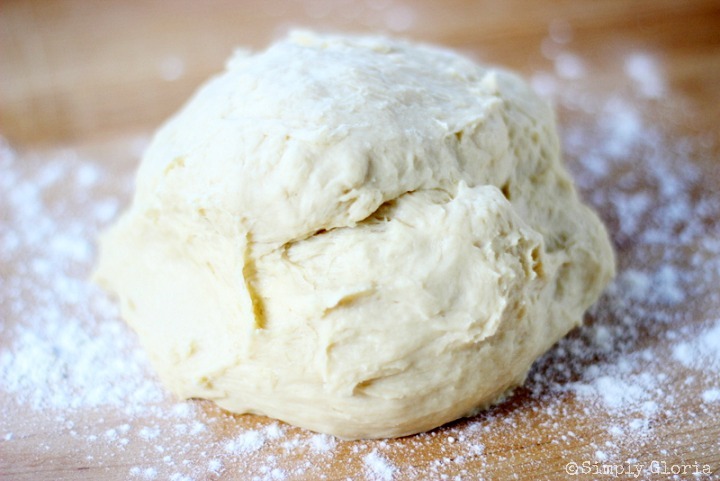 Roll out the dough (on the lightly floured surface) to a rounded-rectangle size about 15 inches by 12 inches. And, about 1/2 thick. Be sure to not over work the dough. Spread the butter flavored shortening across the dough. 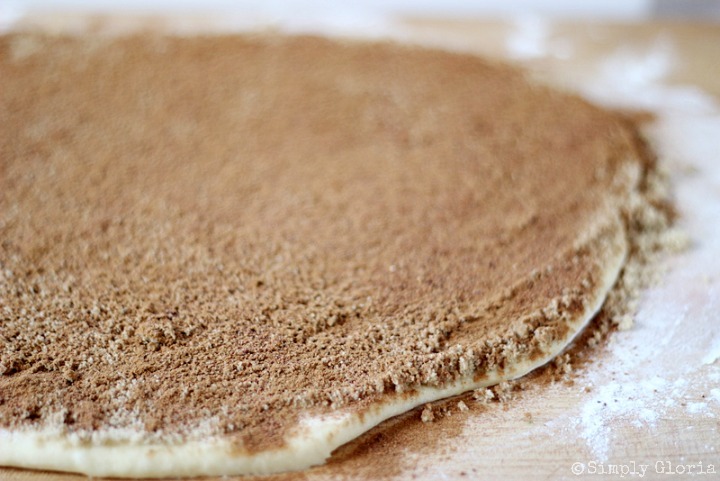 Spread around the brown sugar and sprinkle the cinnamon and nutmeg to all the edges. Except the one edge you are going to have the roll sealed. To roll into a log form, start with one of the long sides, tuck and roll the dough until you come to the very end. Make sure to have the last part of the flap onto the bottom to hold it together. Grab a long piece of thread and slide it up underneath the roll. Crisscross the thread while going down onto the dough. Set rolls off to a draft-free zone (uncovered) to rest and puff (rise) for 10 minutes. Bake for 20 minutes on the bottom rack in your preheated 350 degrees oven. Beat the cream cheese for 30 seconds. Then add powdered sugar 1 cup at a time, alternating with creamy eggnog. Add the rum extract and whip until you have the desired consistency. Sprinkle in the cinnamon and nutmeg. 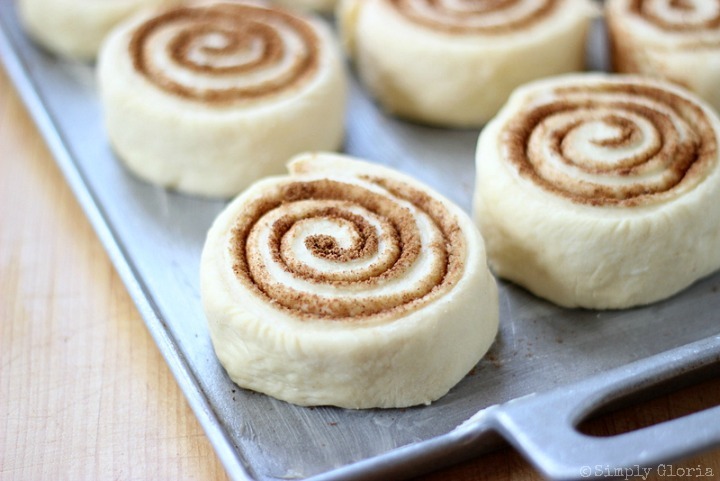 Spread on the icing on the hot baked cinnamon rolls as soon as they come out of the oven. I like to do this, because the icing starts to melt in between all of the swirling crevices. These are just as perfect when you make them the night before. 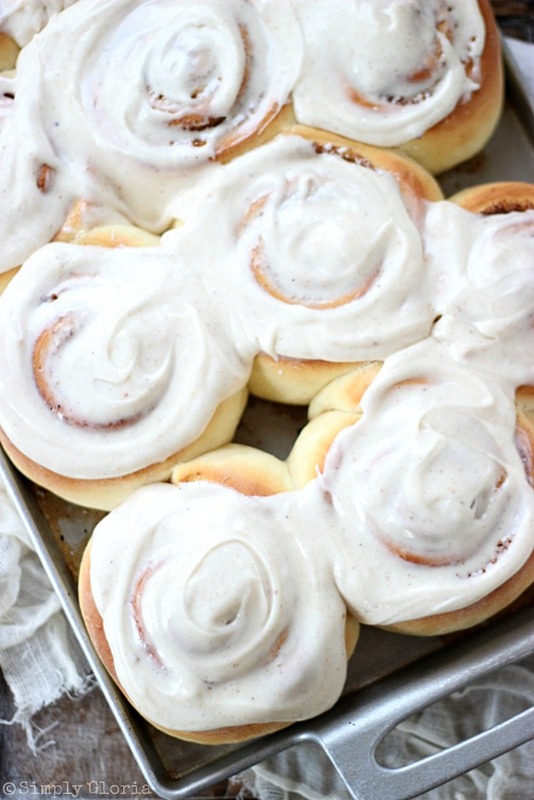 Cover the unbaked pan of cinnamon rolls with plastic wrap and set into the refrigerator over night. Unwrap and allow to get to room temperature. Place in oven and bake. Will stay fresh for up to 3 days in a stored container. But best the day of baking. Makes one large dozen. For smaller rolls, this recipes will make 18 rolls. I hope you enjoy these homemade baked Eggnog Cinnamon Rolls as much as my family and friends do! These look amazing. I love making cinnamon rolls for Christmas morning. Oh my goodness! 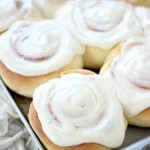 I definitely could not be trusted around a panful of these cinnamon rolls! They look absolutely PERFECT, Gloria! That icing is speaking wonderful things to me. 😀 Pinned! 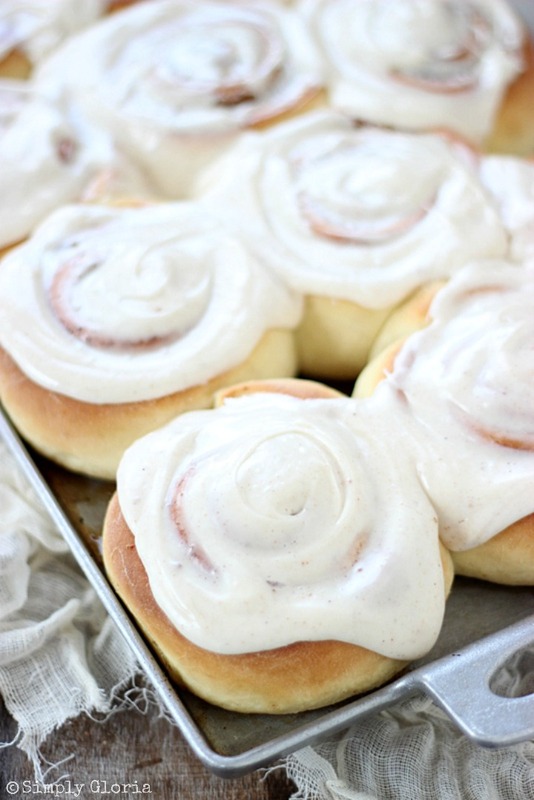 I’m a sucker for cinnamon rolls….mind you, not making them because you know how I feel about working with yeast. I love to eat them! Thank goodness my hubby is a whiz with bread goodies and he’ll happily make these because he loves cinnamon rolls as much as I do. And that eggnog frosting is TDF!! OMG! I want to plant my face straight into the entire pan!! Looks incredible. 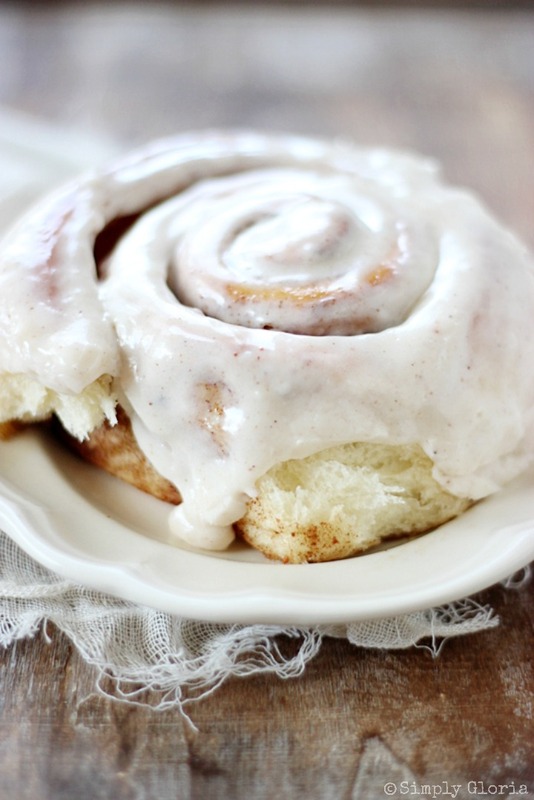 Your cinnamon rolls are always the most perfect things! I’d much rather bake with eggnog than drink it, and these cinnamon rolls are on my radar. Pinning! Gawd Gloria! These look amazing! So perfect and fluffy and pretty and RUM!! Yes. North Carolinians don’t like drinking until 10 am either. Unless you hide in the closet. I am totally making these!! Oh man what a great idea for Christmas breakfast!!! These are awesome! 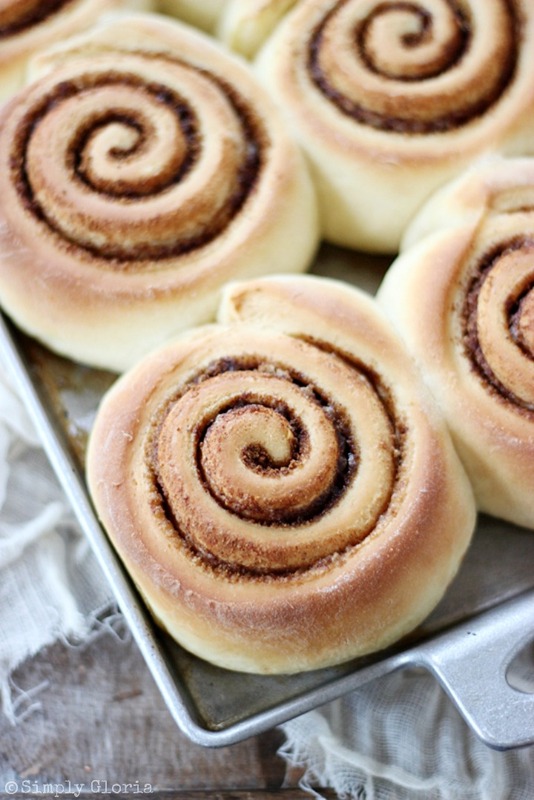 My mom used to make cinnamon buns every Christmas when we were kids… brings back such great memories! The glaze looks absolutely amazing here!!!! Your rolls look so perfect! And that glaze. Just hand me a spoon! Pinned. Whoa. These are my kind of breakfast! Getting the double dose of eggnog and rum extract makes me happy! 🙂 The combo of creaminess and warm spices has Christmas morning written all.over.it. Pinning these!